Hello again, everybody! I'm back from my holiday vacation, and eager to jump once more into the fray! 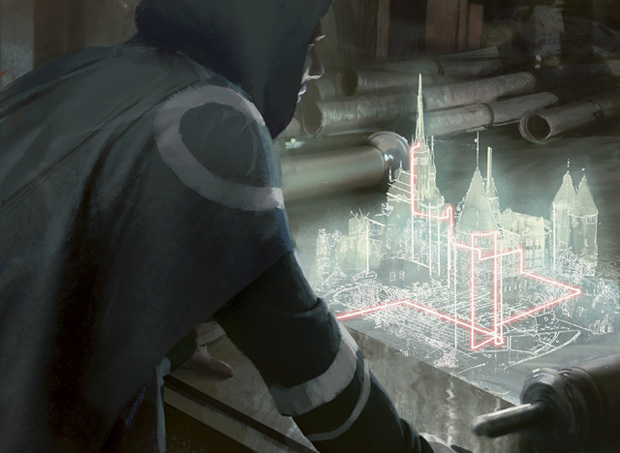 Last time, we began a series on designing an all commons playtest, from start to finish. In the first part, we talked about the overall structure of a playtest set, and how one can use concepts like as-fan to help quickly create such a structure, using our custom collaborative set Tesla as an example. This time, we're going to learn how to quickly fill in this structure with actual cards. Much less intimidating, isn't it? We're still designing cards from whole cloth, but there's a lot less of them to design at a time, and we have a lot more guidelines to follow. In addition, we have the techniques from Make Common Cause to use - we can refer to 'staple' designs, find the bodies that work best with the mechanics we're designing for, and figure out how to push our designs to be as simple as possible at common, and as innovative as possible at common. For example, let's start at the very beginning of our checklist - let's design three white cards with the Justice mechanic. 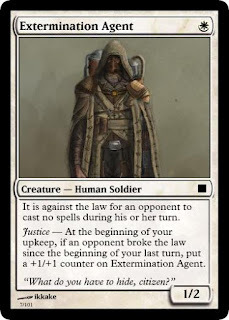 Cards featuring this mechanic proclaim some sort of action to be 'against the law', and then punish our opponent whenever they 'break the law' with a trigger labelled Justice. The first thing to note is that this is a very broad mechanic, so we're going to want to think about what we want cards with this mechanic to do. What are our goals for these cards? What do they do best? What are their weaknesses? Now, justice cards encourage our opponent to stray away from certain actions. Hopefully, these outlawed actions are ones that slow the game down, or make it less exciting. If we look to the werewolf mechanic from Innistrad, we get a good idea of how to make such a mechanic work. The werewolf mechanic is constantly encouraging our opponent to be casting spells, no matter what side they are, because the more spells that are being cast, the more exciting the game gets. Thinking along these lines, three 'laws' come to mind. First, 'It's against the law to block this creature' - this encourages our opponent to let the game get closer to a conclusion! 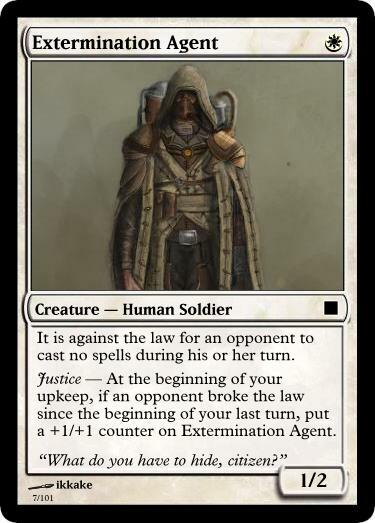 Second, 'It's against the law to attack with exactly one creature' - this encourages our opponent to attack with at least two creatures, making combat more exciting. And lastly, 'It's against the law to cast no spells during our turn', which encourages the opponent to cast spells. A 3/1 can be either aggressive or defensive, but the ability really pushes we towards offense. This one lets we take advantage of the times when they might not have a lot of creatures, so simply must attack with one to keep up pressure - or the rest of their creatures are too small to attack well, meaning we gaining first strike is significant! Here, the body I began with was an Oreskos Swiftclaw. Note that this card is pushed - its power level is a bit higher than that card! This is because I want to make sure people play with the cards that have the mechanics I'm playtesting. If it's way too strong, I can lower its power level mid-playtest. This is the inverse of the previous card, in that it decides to go defensive, rather than offensive. Many times, players only attack with a single creature when they are still developing their board, or when that creature is very large. This ability effectively blanks an attacking with creature 2 or less power, which is what attacks during the developing stages of the games are often like. And against the big beasties, it helps we recover a bit of the life we lost. However, as long as they can attack with a partner, they'll have too many people for the law to touch them! Here, I was inspired by a Loxodon Wayfarer, but since I felt the life-gain might be strong, I bumped the toughness down by 1. Finally, we have this one. The earlier we drop a creature with this law, the more likely we are to encounter a turn where it comes into play - so I figured a 1-drop would be very fitting. In addition, the times opponents are unlikely to cast spells is when there's a board stalemate or they have the superior board, so growing in these times is great. The 'staple body' of this one is Sanctuary Cat, which I knew to be on the low end of power. One thing that's important to keep in mind is that we're going to want to be thinking of our color's mana curve while designing the cards for our mechanics. These cards are not in a vacuum - if we make them all 2-mana, for example, our color is going to have serious problems in our playtest! Make sure to try to look for distinct 'staple cards' to design around, for each of our cards. Now, after we've designed all of our mechanics representatives, we should be left with quite a bit of our file complete. For an early playtest - like the one we're doing - we'll want to first fill in the rest of the file with simple descriptions of what kind of 'staple' card we want to fill that position, if there's no such card among the ones we've designed already. For example, none of our mechanics representatives ended up being a 'creature removal' card in black - so that was put into the file. Just a black card with the name 'creature removal', that's all! After filling in the rest of the file like this, we have two options: we can sit down and design all of these ourself, trying to make a rough draft of our set, an 'initial sketch' if we will; or, we can fill in the rest of the file with tried-and-true cards from previous Magic sets that fulfill those roles - exactly as I suggested in Make Common Cause. The first approach has the big upside that it lets we test a lot of cards at once. As I said earlier, we often want to err towards testing more rather than testing less. However, at the same time, we still want 'control variables'. If the cards we designed were too strong, or too weak, or too complex, then we're going to be pulling focus from the mechanics, which is what we're trying to playtest this time around. If you're further along in the set, or have already locked in your mechanics, then this is a far better type of playtest to go with. On the other hand, if we want to focus on only the cards with mechanics, using reprints would work a lot better, as we have a lot better knowledge about what to expect from them. Typically in this case, the reprints should be on the lower end of the power level, to draw focus towards the cards we're intending to test. I personally try to get as many reprints from the same set - to conserve the 'feel' of the set and the natural synergies intended between them - but you can also just pick your favorites! Blue: 10 creatures. Notable noncreatures: Soft counterspell, hard counterspell, bounce, a 'lockdown' removal, card draw, a spell that taps down creatures. Black: 11 creatures. Notable noncreatures: Creature removal - destroy and -N/-N. Discard. Card draw at a price. Disentomb. Red: 11 creatures. Notable noncreatures: Burn - creature, player, creature OR player. Artifact destruction (especially in Tesla)! Combat trick, team combat trick (especially with Thopters)! Green: 11 creatures. 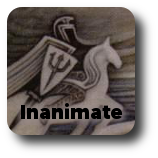 Notable noncreatures: Lots of combat tricks! Artifact and enchantment destruction. Flying removal (especially with Thopters)! Fight. Fog. Ramp. Artifact and land: Color-fixing artifact. Two equipment. Again, this accounts for a lot of our cards! It's quite easy to put together a set out of reprints, as long as you're looking to past sets for inspiration. For my playtest set, much of it was assembled out of Origins, M13, and M15, with a few other random cards thrown in that fulfilled certain needs. First, I had way too many cards with mechanics in the file. For example, originally 90% of black's creatures had a mechanic in their text, which was just too much. This is to be expected, as we erred on the high side when estimating how many cards we'd need in each color with each mechanic, but it means you're going to have to look at the file critically and figure out where cuts can be made later on. As we're playtesting mechanics, it's okay to be higher than the 30% average for a set - we're gonna shoot for something more like 40% to 50%. To solve the issue with black, I dropped the number of black cards with Justice down to two from three - it was done to shore up black's numbers, and clearly it worked a little too well - and then I cut envision from the file, as it was also causing problems in the other colors. Envision will be playtested another day! In addition, as complexity was high and there was no reprint mechanic, and they're frankly very similar mechanics, I replaced Battle-Forged with Renown for the file. Second, there were multiple issues with blue! Too many fliers... too similar fliers... no 5-drops... and so on. This is a great time to talk about two basic needs of a set - how many fliers do we have, and what's our color's mana curves look like? Typically, our mana curve in a color should be quite similar to the mana curve we'd like in a deck, for obvious reasons. If the color's mana curve leans low, so too will decks using that color. And likewise, the number of fliers in a color is very similar to the number of fliers that color's decks will run. Keep both these in mind, or you'll end up with wonky decks, or an uninteractive format where one color flies over the rest. After fixing these issues, among a few others, the playtest file... was complete! The cards have been ported to the Magic Multiverse site for Tesla, and I'll upload the complete file... right now! Here's the link to the MSE file, for your perusing pleasure, and here is the Cockatrice files for your playtesting pleasure, bundled with an updated Tesla art file. Do note that it's a horrible rough draft, and meant to be a quick-and-dirty playtest, just to get started! The next step, of course, is to actually playtest it! The playtest report - and how to do a playtest well - will be the subject of next week's article. Until then - have a great week, everyone! A little late for me to say this, I know-- but Justice has this problem where it's a bit too broad. The conditions are all different, *and* the rewards are all different. It's a lot for players to keep track of, and it adds a bunch of complexity. If the playtest bears this out, I'd recommend an approach similar to evolve or outlast: have the reward be the same in all cases-- say, "put a +1/+1 counter on this creature"-- and then if you need to up the power level or make a creature feel rare, reward it for having a bunch of +1/+1 counters on it. Of course this plays in the same mechanical space as battle-forged, but that's OK by me because battle-forged never struck me as a good fit for Tesla. Again... just my two cents. Mm, I was thinking that myself while designing the Justice cards for the playtest. I can definitely see consolidating all the effects - having the three separate Laws has worked well in playtesting so far (you rarely have all three out) but with the variety in effects it might get confusing as well. In the playtest, +1/+1 counters were quite strong, but not unbeatable, so that's certainly an option. I'm also thinking something like +2/+2 UEOT would work, if we don't want that. Still, I did notice we lost a 'continual progress' mechanic in the set, and this would do a great job of that. Battle-forged really hasn't been a good fit, yes. It was nice originally, but the direction we've moved has gone away from it. I agree with lpaulsen. Also, generally speaking it is better to reduce complexity by consolidating inputs rather than outputs. It is far more important for players to be able to remember the inputs so that they can avoid triggering them than remember the outputs, which will always be "something good happens for my opponent". A world with one crazy law that's despotically enforced actually tells a more interesting story than a world that's crazy just in the number of laws it has. Kaladesh makes finding that one law easy: Natural magic is banned. Forbidden—Whenever a player casts a spell with two or more of the same mana symbol in its mana cost, EFFECT. Forbidden—Whenever a player casts a spell with two or more colored mana symbols in its mana cost, EFFECT. Forbidden—Whenever a player casts a spell using only basic lands, EFFECT. Forbidden—Whenever a player pays an additional cost to cast a spell, EFFECT. Forbidden—Whenever a player casts a spell without paying its mana cost, EFFECT. Forbidden—Whenever a player casts a spell for less than its mana cost, EFFECT. Well, the key to making good Laws is that your opponent can play around them, but is increasingly lead towards breaking them, and if they play around them the game is pushed towards a conclusion in a fun manner. 1-3 basically invalidate deckbuilding and tell players not to cast spells, which is bad. 4-6 basically say 'do not enjoy our fun new mechanic'. I think a single law is an interesting idea, but we need to find the right law to make it work. 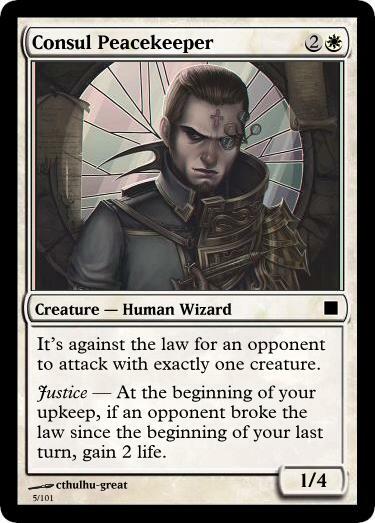 The flavor behind Justice as it is is that Kaladesh has involved into a police state, which is represented by lots of laws and oppressive surveillance. Sure, a single law also captures that, but it feels more zealous/fanatical than lots of laws, which feels more like a bureaucracy. 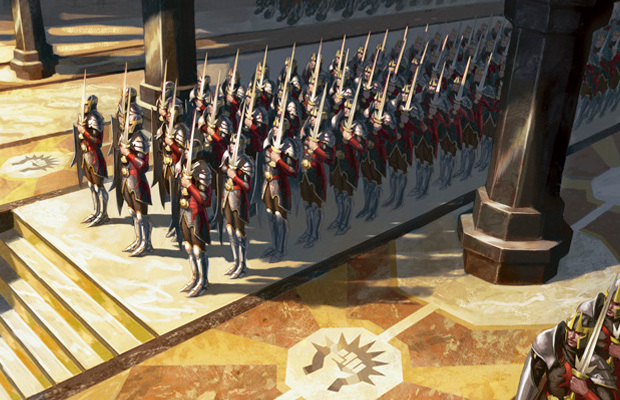 Of course, zealous/fanatical is perhaps exactly what we want, given how we saw Kaladesh last time. So that's not a criticism of the new method proposed - just a note of the difference. "It's against the law to spend mana except to cast spells?" "It's against the law not to attack?" "It's against the law not to play a land or cast a spell?" The first one doesn't quite push a game to its conclusion, but it could work. The second one works, but the flavor was tricky for me to figure out, so I changed it to 'attack with exactly one creature'. You either don't attack, or you bring enough guys that I can't enforce the law on you. The last one is very close to the 'not cast a spell' law we currently have, which has playtested very well. It could work for the 'natural prejudice' too - currently that's actually how I flavored it. Demonstrate your 'abilities' in a test or be subject to persecution. To Havelock's and Jay's point about consolidating inputs: In general, yes, that's absolutely true. Almost every line of text tagged with an ability word should always start out the same way. However Justice is to my mind the exception to that rule. 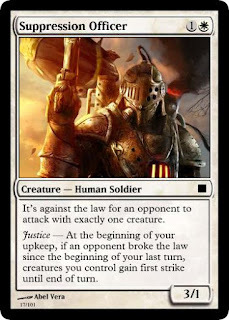 The *whole point* in Justice is that there are multiple laws, each one set up by a different card, and whenever an opponent breaks *any one* law, you get the lawbreaker triggers for *all* of them. Consolidating down to just one law, or even just one law per colour or one law per colour at common, vastly eliminates the appeal of the mechanic, for me. No longer are you putting together combo pieces; instead it's just a conditional way to grow your creatures or whatever. 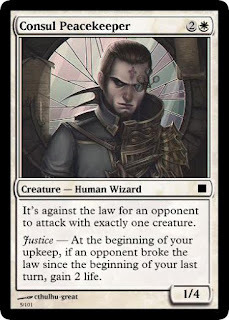 If you consolidate Justice down to one law per colour at common, I'd expect the playtesting to go "bleh, this wasn't very fun, not worth the space". Keep multiple different laws, especially within each colour, and I think it should work out a lot more interesting. Of course, this is all theorycraft; I've not actually ever played with Justice since I first saw it years ago. My comments should certainly be overridden by those from anyone who's actually playtested the set. Great article as was the last one on set layout! I actually wouldn't mind seeing more of these articles (shorter versions maybe) so we could be helping out with some of this stuff. Filling in all these cards sounds like a lot of work but (hopefully) easily outsourced. Also, filling in was surprisingly not too bad. Many of the designs came straight from the Multiverse, with minor changes to fit the skeleton and curve and such, and the rest were plucked from sets with the help of a few friends. The big issue was juggling everything to make sure I had enough of the right things in the right places, which isn't easy to outsource unfortunately, as it requires a holistic executive view of the entire set at once. Still, the more designs we get on Multiverse the better, because it gives us more options for what designs we can put the mechanics on. I know I'm going to be iterating a lot in the near future, to give myself lots of flexibility for designs - variations at every CMC, for example. That's the kind of stuff that I would love help with. Great content regardless of length! I also like the idea of duel decks you all had; how will you be playtesting the draft? There's been many duel decks, actually. Check out the Multiverse comments to see a few examples, made by some of the Artisans. I intend to get on the Duel Decks train myself soon! It's a great way to give focused attention to mechanics. The draft has been playtested in a few ways. One method I stumbled onto with Reuben Covington was 'pseudo-sealed' - you make a 40 card deck out of any cards you like, with a max of 2 of any card. Captures the feeling of sealed without needing to negotiate a pool or program. To test Sealed, you simply need Magic Set Editor. It has options for opening packs in the 'Random' section. To test Draft, I plan to use webdrafter.geogen.cz which has the ability to upload MSE files and convert them into an actual draft. It's a wonderful website! Way too many mechanics in the card file. Combine is still there, as are access the machine. Each justice card looks balanced on its own, but it seems like they can add up quickly to the point that the opponent is forced to break the law. Now, I don't known this for sure because I have never taken part in a playtest of the set before. I defer to your expertise. Canister cards also seem a bit texty. Now, the difference is that we have a larger quantity of individual mechanics. This is completely known! The goal of this playtest WASN'T to produce a rough draft of the set. It's just to have a format to test the mechanics in. Before we move forward on the set, we want to know which of the mechanics actually play well, which ones aren't as necessary, and which ones reinforce the themes of the set experientially. Judging only in terms of keywords, we're doing fine - we have five, which is normal for a set nowadays. Canisters are indeed wordy, but we're using Scions as a basis that it's possible to do them in quantities. And Thopters aren't too complex, I believe. Advancement wasn't in the playtest file because it's been previously playtested and found to be solid but unexciting. I do intend to playtest it more with some of my own ideas, but for this playtest, I was focusing on seeing how some less-tested mechanics interact. Justice cards do have a sense of inevitability about them, which is intentional - if they never went off, it wouldn't be super exciting. The easiest one to avoid is the 'attack with exactly one creature' one. The hardest is 'cast no spells'. I agree that it's possible they'll build up, but it's actually surprisingly difficult to get more than two laws out at once. Still, I have my eye on Justice! Also readdressing your (completely true) point that Canisters are wordy - in KTK, Morph was a very wordy mechanic. But by introducing Morph overlays, they were able to increase comprehension by having a commonly available reference for it. I hope that Canister tokens in packs will also reduce confusion simply by sheer accessibility. And again, Scions seem to do well. Scions ARE more intuitive though. Thanks for the keen criticism!